Hinowa, an industry-leading manufacturer of tracked vehicles, has now launched the new Transporter TX2500 model with a 3-way dumper bed. This previous version, with a swivel dumper bed, already distinguished itself by its speed, stability and transport capacity. Today, the version with a 3-way dumper bed offers an additional function that allows for tipping to be performed on three sides, with the automatic opening and closing of the sides. 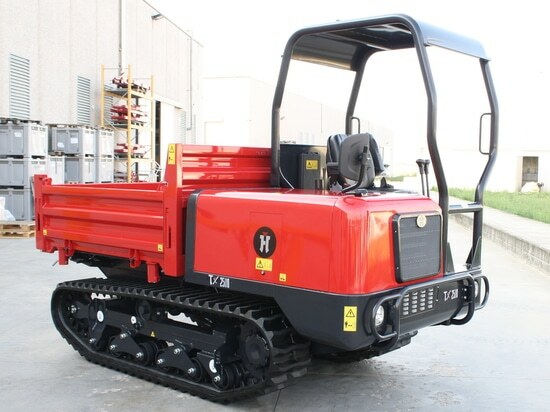 Hinowa continues its progress in the field of super-compact and highly manageable tracked vehicles. The company has been dedicated to the development of machinery suitable for daily use in confined spaces and on rough terrain for many years. Models that stand in sharp contrast to the cumbersome and less practical traditional means. The company is known for its tracked undercarriages, as well as the various lines of powerful and highly-manoeuvrable means to which the TX2500 transporter belongs. Hinowa, whose products have always been characterized by advanced technologies and production techniques, has once again confirmed its leadership in this sector. The Transporter TX2500 is the ideal tracked vehicle for loading and unloading materials in a quick and safe manner. Thanks to its nearly 50 HP engine, the TX2500 model is even capable of handling the most difficult and uneven terrain. Each component has been specifically designed to ensure maximum comfort and performance. The technical data sheet offers a detailed overview of the unit's specifications: a maximum capacity of 2500 kg, six wheels on each side (two fixed and four floating), a comfortable seat capable of rotating 180°, and FOPS structure for the operator's protection. A large diesel tank and a hydraulic oil cooling system guarantee maximum performance and allow for an intensive work pace. The special rubber tracks with mobile wheels allow the TX2500 tracked transporter to reach a surprisingly high speed for its category: up to 11 km/h. In addition to these advanced performance levels, with respect to the previous model with a swivel dumper bed, this new version also offers the possibility of 3-way dumper bed tipping for even faster unloading operations. 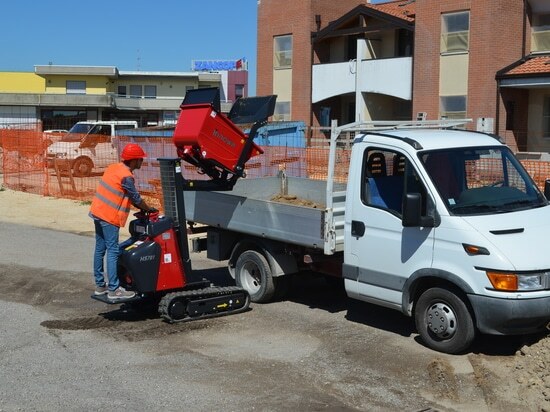 A more in-depth analysis of the technical specifications, which include a load capacity of 1.36 cubic metres, two speeds (0-6 km/h and 0-11 km/h), and a weight of 2700 kg, reveals how this machine guarantees optimal performance under any operating conditions. Despite its power, with a length of 3.3 metres, a lowered dumper bed height of 1.4 metres, and a width of just 1.7 metres, the TX2500 is a super-compact tracked vehicle that's exceptionally easy to manoeuvre, even in confined spaces. The tipping of the dumper bed is controlled by a telescopic cylinder, which is connected by articulated joints that allow for movements on three sides with an angle of 55°. The new model is even equipped with an intelligent unloading system that automatically opens and closes the sides. Each side of the dumper bed is closed by two pivots; in order to prevent errors during the operations, when one side is opened, a specially designed safety system ensures that the others remain closed. Safety is one of the main principles upon which Hinowa was founded, and the design features and high quality components of each model guarantee exceptional reliability. The driver's position has even been rendered safe and comfortable thanks to an anatomic seat, a covered structure, safety belts, and a frontal support. What's more, the presence of a rear view mirror and the possibility of rotating the driver's seat by 180° guarantee excellent visibility from any angle. The operator can therefore manoeuvre the vehicle from both directions, while at the same time monitoring everything happening around them. 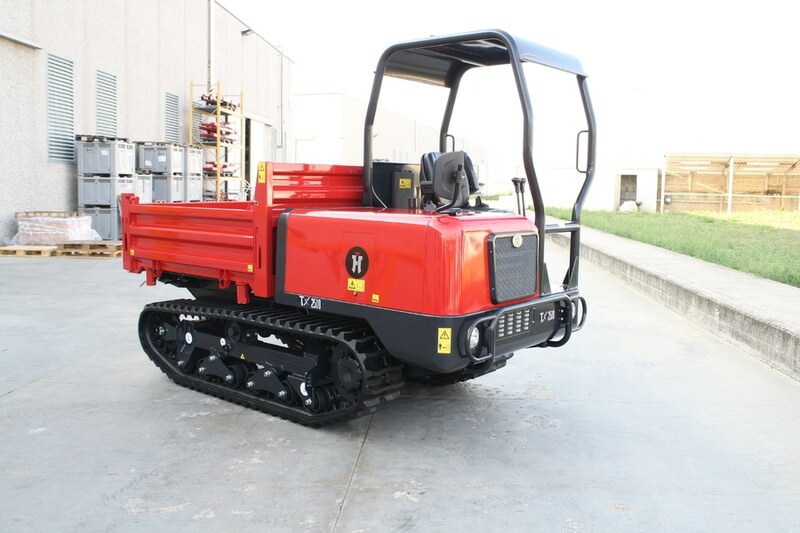 The TX2500 tracked transporter is also extremely easy to drive. The control system is managed by a hydraulic system of the latest generation with top-of-the-line components that ensure maximum precision. The unit is also rendered easy to drive thanks to a simple and intuitive control panel, which greatly simplifies the operator's job. Even on a 2700 kg machine like the TX2500, the details make all the difference. The intuitiveness and precision of the control panel, the top-of-the-line components, the ease of access to critical maintenance points, the 40-litre diesel tank, the 2500 kg load capacity, the cooling system, and the travel speed from 6 to 11 km/h, are all features that render this tracked vehicle a valuable ally for improving work quality, maximizing efficiency, and enhancing productivity. Hinowa sets high goals for its products, and its line of Dumpers has established itself as a benchmark among the industry's professionals. 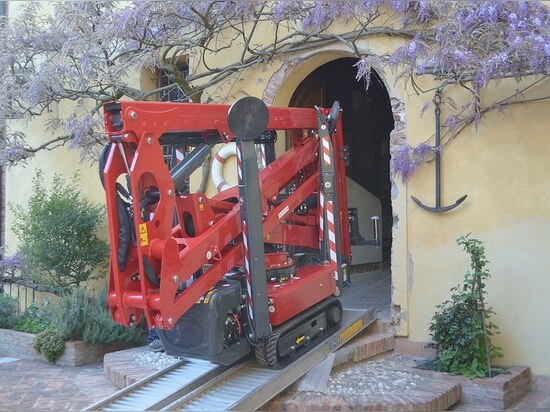 The tracked vehicles produced by this Italian brand are renowned for their compactness and manoeuvrability: two fundamental characteristics for working in confined and hard to access places. In addition to be exceptionally robust, these vehicles are also extraordinarily agile, and are designed to handle any type of terrain (including uneven, sandy or muddy surfaces) without sinking or slipping. Hinowa Dumpers even guarantee excellent traction on slopes, and offer unparalleled stability. 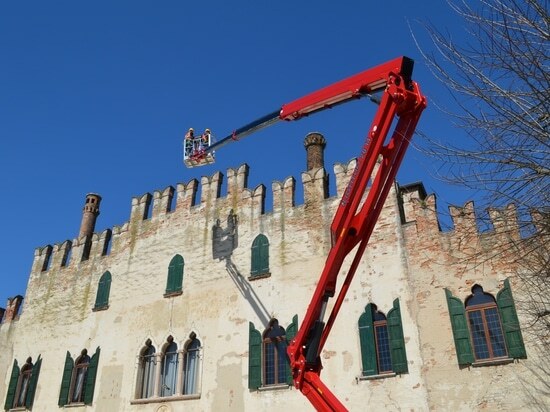 Hinowa's engineers are constantly working with passion and dedication to develop increasingly innovative machines capable of ensuring greater safety, facilitating the operators' work, and respecting the needs of the environment. That's how versatile and technologically-advanced products like the Dumpers are born, which are becoming increasingly well-known and appreciated by a vast range of users, who find them easy to use and suitable for various work requirements, whether at construction sites or in the fields. The TX2500 is the largest model in its range, and has been specifically designed for quickly and easily transporting heavy loads. Thanks to its functions and the new 3-way dumper bed, this tracked transporter is destined to soon become one of the most popular models in its category.